The decision to homeschool is one to which most parents devote a generous amount of time and prayer. There are many reasons people decide to homeschool. They may want to disciple their children full time in their faith. They may feel that the academics in their local schools are sub-par. They may have children with special needs that are best met one-on-one. Their children may be highly involved in a sport or pastime that makes it difficult to spend seven hours at school each day. Whatever the reason–and there are many others–parents who choose to homeschool generally have invested much thought into that decision. Deciding to homeschool is one thing; implementing that choice can be quite another. There are a variety of potential obstacles to a parent’s resolve. Well meaning (or not-so-well-meaning) friends, family, and neighbors may question, or outright disagree with your decision to homeschool. Your child may be uncooperative. You may earnestly long for some time alone and some peace and quiet. These and many other distractions may cause you to doubt your decision. So how can you increase your chances of success? How can you strengthen your resolve, even before you are tested? 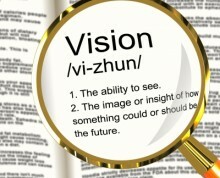 By casting a vision for homeschooling. Cast a vision. Decide what it is that you really want for your family. Why are you homeschooling? You invested time, energy, and prayer into that decision. So invest a little more into getting your reasons and your vision on paper. Be specific. What Scriptures backed up or led you to that decision? What factors of your situation make homeschooling the best option? What is the most important thing you want to accomplish with your children? Write these things down. Then, when you feel like loading all the kids up on the large yellow vehicle that rumbles down your street each morning, get out that document and remind yourself why you’re educating your children at home. When your neighbor says she thinks only certified teachers should homeschool their kids, and you wonder if she’s right, get out that paper and remind yourself that God called you to teach your children. Whenever you’re discouraged or uncertain, read over your vision and test it to see if what you wrote down is still true. If it is–and it probably is–you’ll most likely regain your resolve. But if you haven’t recorded your vision, it may be difficult to recall your original intentions when discouragement, frustration, or uncertainty set in. A vision document also may be helpful if you are considering changing your approach to homeschooling. You can measure that choice against your vision. There may be times that you want to make adjustments to your vision. As your children mature and your circumstances change, it may be beneficial for you to do some tweaking. Whether you question the decision to homeschool or you simply need to be reminded of your original reasons and plans, a vision document can be a powerful tool for your homeschool and for your family. Effective classroom teachers know that one of the secrets to having a good school year is establishing order and respect with their students. In fact, in many schools, classroom management is the curriculum during the first weeks of school. Academics take a back seat at this point. Why? Because there will be no effective teaching or learning taking place unless students follow directions and procedures. Students have to respect the teacher, or the school year will be a disaster. The same principle applies to homeschooling. Even if you only homeschool one child, that child has to be obedient if he is going to learn. 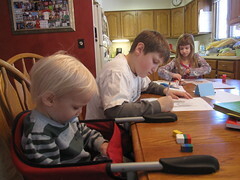 If you homeschool multiple children, each one has to follow your instructions and rules. If even one child refuses to respect you, all of your children may suffer. I know this from experience, both as a classroom teacher and as a homeschool mom. In one class I taught, things were going pretty well in my classroom. Kids knew the routines and generally did what I said. Then a new kid entered the scene. This student wasn’t used to following directions at home or at school. He came in and disrupted my entire class. There wasn’t much learning taking place for awhile. Looking back on my original homeschooling experience, I can say that this was the missing ingredient. I felt so pressured to complete the academic work that I overlooked the absolute necessity of first-time obedience. I got frustrated, nagged, lectured, and got headaches, but it never occurred to me to simply stop. Stop working on academics entirely. Stop and focus on making sure my children obeyed me. If I would have spent whatever time it took–even if it was a whole school year–to establish first-time obedience, I believe I would have continued to homeschool. So here I am, beginning this journey again. This time I’m taking a lesson from my classroom teaching experience. This time I will focus on first-time obedience before we ever pick up a pencil or open a textbook.